Rooted in the idea of exploring and supporting artistic expression in nature, Wild Rice Retreat is a space for artistic and healing workshops, classes, meeting space, and special events. Experienced (local and visiting) instructors are encouraged to inquire about our programming to help our retreat team create the most vibrant, creative, and beautiful destination retreat center in the upper Midwest. Local partnerships foster and support the Chequamegon Bay arts community, local businesses, and residents. To learn more about renting Wild Rice Retreat for a private event or to express interest in a specific retreat that you see or do not see on our Upcoming Events page or Calendar, please send us a note. 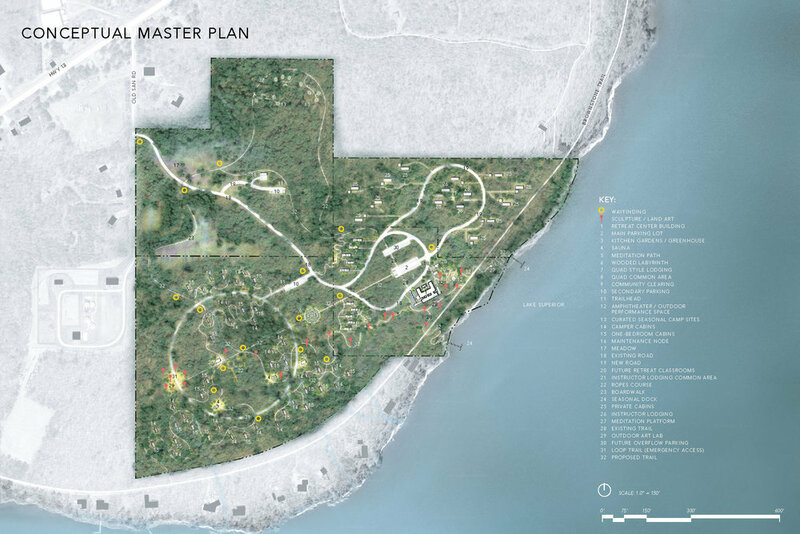 The proposed master plan is a sustainably designed year-round regional destination that nurtures individual creativity and human development. As a center for arts and well-being, thoughtfully and lightly placed within its 114-acre woods, Wild Rice Retreat is a remarkable destination for workshops, classes, multi-day retreats, and communal gatherings guided in the areas of nourishment, expression and movement.